Everyone knows that Big Game parties are all about the appetizers and finger foods. This year, try offering something new and delicious on your football party buffet: A colorful variety of hors d’oeuvres served on a warm, fluffy, mini pita bread called Kontos Cocktail Flatbreads. Cocktail Flatbreads are two-inch mini pita disks from Kontos Foods that can be used as the basis for creative party foods. 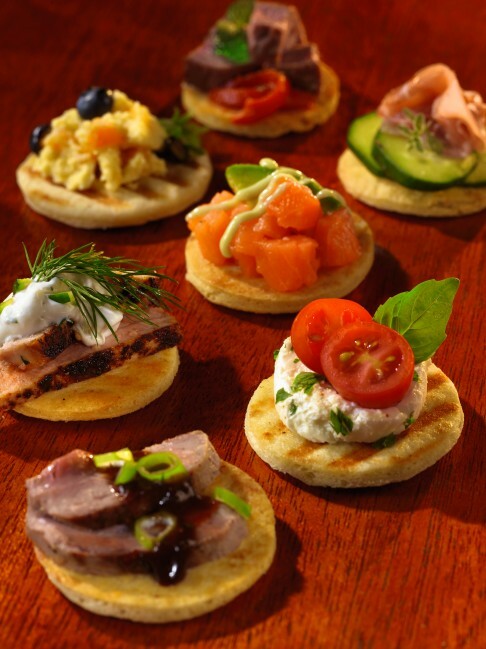 Use Cocktail Flatbreads to assemble yummy appetizers with sliced meats, seafood salad, chicken salad, or sliced fish. You can also use them for juicy hamburger sliders, pizza samplers, or serve with dips. “The mini-flatbreads come with café-style grill marks, which make them an attractive and delicious base for simple, colorful hors d’oeuvres. Before assembling your treats, warm the bread for 1-2 minutes at 375⁰ F degrees to enhance their flavor and fluffiness,” said Demetrios Haralambatos, executive chef at Kontos Foods. Grilled Beef or Pork Tenderloin. Place sliced strips of grilled beef, roasted pork tenderloin or pulled pork on the Cocktail Flatbread. Drizzle with gravy, steak sauce, BBQ sauce or horseradish mayonnaise. When using beef, try topping with your favorite slivered cheese. Garnish with dill or scallions. Chicken or Tuna Salad. Prepare chicken salad with tiny diced chicken, apples and walnuts. Or, prepare tuna salad with chopped celery or sweet corn. Dollop a teaspoonful of your salads on the Cocktail Flatbread. Garnish with sliced cherry tomato and fresh basil. Smoked Salmon. Layer small pieces or chunks of your favorite smoked salmon on Kontos Cocktail Flatbread. Top the salmon with sliced avocado, horseradish mayonnaise, slivered cucumber and/or picked ginger. Garnish with capers or a small dollop of Greek yogurt, if desired. Hamburger Slider. Grill a small hamburger, or cheeseburger, and place between two Cocktail Flatbreads. Garnish with your favorite condiments, lettuce and sliced plum tomato. Pizza Samplers. Spread a teaspoonful of pizza sauce on each Cocktail Flatbread. Sprinkle shredded mozzarella or mixed shredded cheese; add pepperoni, sausage pieces, mushrooms if desired. Bake in oven or toaster oven for 5-7 minutes at 375⁰ degrees.